When I was a kid all the pennies had wheat on the back. Some were made of steel. Lifesavers, gum and candybars were a nickel; and cigarettes were a quarter. Each make of car had more than one model, but they were all the same except for the trim! Did I say life was simpler back then? Well, maybe. The rest of the coins in my pocket were a curious mix. There were two kinds of each. There were dimes with Roosevelt on them, like the present ones, but they were solid silver. There were also the older, Winged Victory dimes known as "Mercury" dimes. In addition to the Jefferson nickels we have now, there were nickels with an indian on one side and a buffalo on the other. A nice big candybar was still a nickel, but a bottle of Coke was already a dime. Funny how marketing works! Yes, George Washington was on the quarter, but there were also the "Standing Liberty" type, with a different eagle on the back. These were pretty coins when they were new, but they were silver, and they wore out fast. The older half dollars were another beautiful classic coin. They also had a standing Liberty on them. This was the last U.S coin that featured "Miss Liberty" instead of the likeness of an actual person. But surprise! The newer half dollars didn't yet have Kennedy on them. They had Benjamin Franklin, and the Liberty Bell! 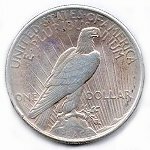 The half dollar was used much more commonly than it is used today. 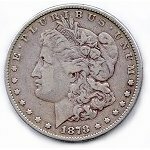 Silver dollars weren't widely circulated, but if you went to the bank and asked for some, you weren't surprised if some of the dates were in the 1800's! These disappeared in the mid '60's along with all of the other silver coins when the "clad" coins came out. 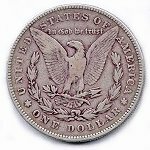 The newer type silver dollar was called the "Peace" type. These were not made in great numbers. 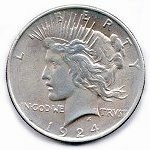 By the 1920's the silver dollar was already becoming less popular due to the increasing use of paper money. Notice the Roman alphabet used in "IN GOD WE TRVST".